The group will examine biology, environmentalism, genetic engineering, robotics, artificial life, genetic algorithms, and other synthetic biologies toward a critical and analysis of current issues and strategies in bio-art. The task is to examine concepts from biology and to use biological ideas, metaphors, and materials to create works of art. The project group will also examine the historical, social, and cultural relationship to biology, the natural world, and biotechnologies. Readings will include topics that reflect on history, environmentalism, and social and cultural criticism of bio-art and technologies toward examining ethics and social issues. Topics include an historical overview of human relationships to the natural world, criticism of contemporary technologies, environmental concerns, current strategies and works in bio-art, artists working in biotechnologies, the effects on communities, and ethical concerns in biotechnologies. Our first project, CathexiSpin, premiered at 01 San Jose in June, 2008. 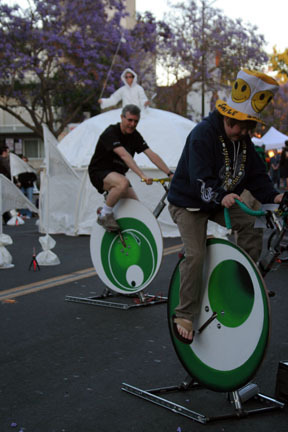 CathexiSpin provided mobile spinning classes in a public outdoor site connected with 01SJ, sites where communities can come together and invest their mechanical energy in autonomous alternative energy initiatives. CathexiSpin operates within principles of emergence and cross-pollination between riders, makers, and the event as a whole. If every spinning class was connected to the grid, imagine the kilowatts of electrical power we could return to the community! To harness the transformative power of spinning-generated electrical energy, CathexiSpin's classes are free and open to the public. The energy created by the collaborative effort of the instructor and participants powers individual batteries that together, form an aggregate reserve of art energy.